Accessories: Accompanied by Rolex International Service Guarantee dated March 7, 2017. 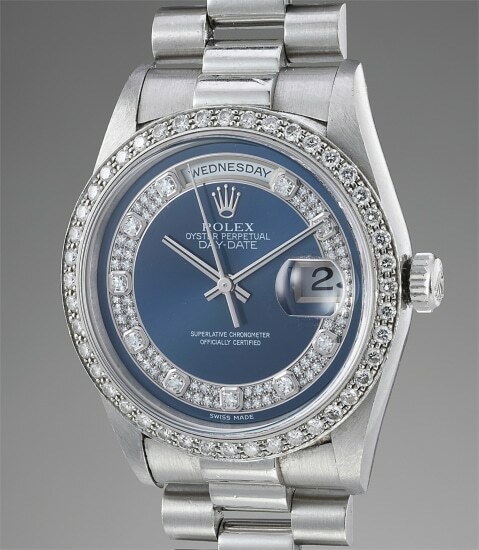 Cased in platinum, reference 18346 most notably features a diamond-set bezel and sapphire crystal. The last digit "6" represents Rolex's use of platinum. Heavy, lavish and luxurious, platinum is known as the noblest of all metals. Displaying a blue dial featuring brilliant diamonds set with chatons and a pavé technique, this timepiece is completely dazzling. Platinum is the rarest case metal for serially produced Day-Date models, and this particular watch, preserved in excellent and most probably unpolished condition, is nothing short of spectacular. It is furthermore accompanied by a Rolex International Service Guarantee dated March 7, 2017.